We have the most secure storage facilities Melbourne wide and all our storage solutions come at cheap rates. Self storage units and furniture storage solutions have never been so affordable and comprehensive. We service to all suburbs throughout Melbourne and our cheap storage solutions combined with a dedicated customer-service puts us at the top of the pile when it comes to Melbourne storage companies. Choose your own sized units and let your furniture be secured in one of the best and most secure facilities in the city. Storage units Melbourne, storage facilities Melbourne, furniture storage – we have it all for you! Providing our solutions to you at cheap rates allows you to save money and not have to worry about forking out huge amounts to secure your goods. We allow you to do it yourself which means you can come in and organise one of the units the way you like it! We have the ultimate storage solutions throughout Melbourne and we offer them to a range of suburbs ranging from Docklands to St Kilda to Hawthorn. Our cheap rates will not be beaten anywhere across the city. The city of Port Melbourne has never seen facilities this proximal, safe and secure. You can be rest assured that your furniture or prized possessions will be locked under the highest security in the city and your furniture will be maintained in the same condition from when you first deposited into one of our units. We also grant self access to all self storage units and you will have your own key to access your own self managed unit. You can use our storage space calculator to calculate exactly how much space you require so you don’t spend unnecessary amounts on wasted space. 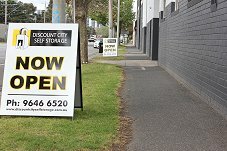 Melbourne self storage has never been so cheap and reliable and that’s all that people are after these days. We service to areas such as Albert Park, Williamstown, St Kilda, South Yarra and Richmond. Discount City Self Storage facilities here at 520 Williamstown Rd, Port Melbourne, we offer our name as our service. We offer Discount Self Storage facilities, we offer them cheap and we're easily located right next to the city. All you need to know about us is available on this site. You can browse around and decide what you need, book storage online or give us a call on 03 96466520 or our mobile phone 0409 987 588. We are located in close proximity to the very heart of Melbourne and we service customers from overseas, interstate, country Victoria and the Melbourne Metropolitan area including Albert Park, CBD, Newport, Elwood and Middle Park. With Melbourne's ever expanding borders, the city is always a place of attraction. If you are moving from one side of town to the other, or even running a small business around town, we are close to everything, Bunning's is straight across the road! Our ideal Self Storage location has easy access in and out and has a fully enclosed undercover loading dock for those days when the weather won't co-operate! With fully armed CCTV and alarmed perimeter doors you can sleep soundly knowing your goods are safe and well looked after. Are you looking for cheap moving boxes and packing supplies? As well as our storage facilities, we also have all the packing supplies you need, we have it all right here. Click on the package solution page and you will find everything you need from our wide range of Heavy Duty Boxes for long term storage through to Furniture Protection Covers and Blankets/Vacuum Seal Bags/ Plasma TV Boxes/Tapes/Stanley Knives/Butcher’s Paper and more. We've got those too, so be sure to ask for a price.